Thanks to Georgia for the picture. 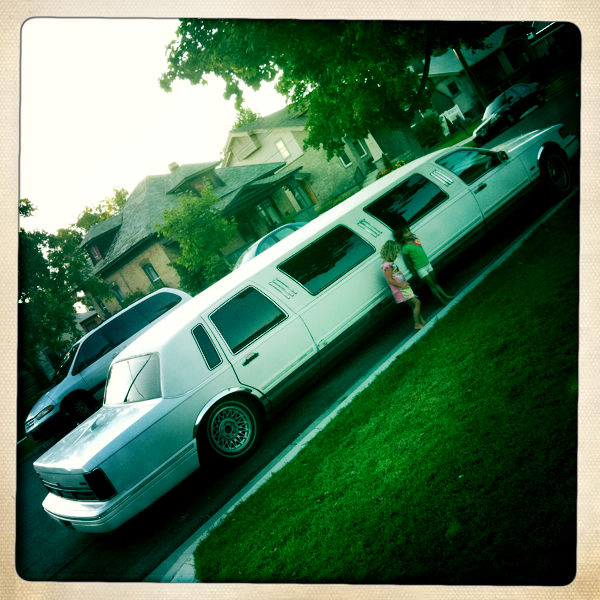 The decision to buy a limo was mine. N8 is just coming out of burying his head in the sand, we made the decision together but he is not one that likes to stand out of the crowd. We were really cramped in our Odyssey. In the limo we have bench seating, a huge trunk, bottle holders, self emptying ice chests, a privacy screen, tv/vcr. The driver can listen to different music than the passengers, there is a phone so they can ring me if there is trouble and so many other features, I believe it is the ultimate family wagon. I needed bench seating for all the cars seats we have to put in and take out. I really felt uncomfortable being inside the van, bum in the air, digging out babies with two car seats on the parking lot pavement and two 3 year olds dancing around. This way the babes have bench seating and I can lean in to grab them, Hazel and CC can come out the other door. There is room for 8 back there...so who's coming?